A rosette sampler is used to collect water samples in deep water, such as the Great Lakes or oceans, for water quality testing. In the setting of standards, agencies make political and technical/scientific decisions about how the water will be used. In the case of natural water bodies, they also make some reasonable estimate of pristine conditions. Different uses raise different concerns and therefore different standards are considered. Natural water bodies will vary in response to environmental conditions. Environmental scientists work to understand how these systems function, which in turn helps to identify the sources and fates of contaminants. Environmental lawyers and policymakers work to define legislation with the intention that water is maintained at an appropriate quality for its identified use. The vast majority of surface water on the planet is neither potable nor toxic. This remains true when seawater in the oceans (which is too salty to drink) is not counted. 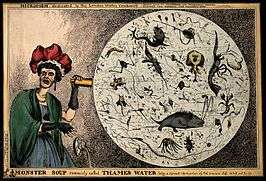 Another general perception of water quality is that of a simple property that tells whether water is polluted or not. In fact, water quality is a complex subject, in part because water is a complex medium intrinsically tied to the ecology of the Earth. Industrial and commercial activities (e.g. manufacturing, mining, construction, transport) are a major cause of water pollution as are runoff from agricultural areas, urban runoff and discharge of treated and untreated sewage. The United States Environmental Protection Agency (EPA) limits the amounts of certain contaminants in tap water provided by US public water systems. The Safe Drinking Water Act authorizes EPA to issue two types of standards: primary standards regulate substances that potentially affect human health, and secondary standards prescribe aesthetic qualities, those that affect taste, odor, or appearance. The U.S. Food and Drug Administration (FDA) regulations establish limits for contaminants in bottled water that must provide the same protection for public health. Drinking water, including bottled water, may reasonably be expected to contain at least small amounts of some contaminants. The presence of these contaminants does not necessarily indicate that the water poses a health risk. Dissolved minerals may affect suitability of water for a range of industrial and domestic purposes. The most familiar of these is probably the presence of ions of calcium and magnesium which interfere with the cleaning action of soap, and can form hard sulfate and soft carbonate deposits in water heaters or boilers. Hard water may be softened to remove these ions. The softening process often substitutes sodium cations. Hard water may be preferable to soft water for human consumption, since health problems have been associated with excess sodium and with calcium and magnesium deficiencies. Softening decreases nutrition and may increase cleaning effectiveness. 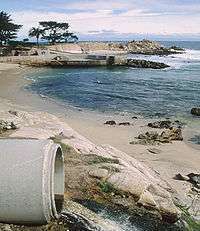 Various industries' wastes and effluents can also pollute the water quality in receiving bodies of water. 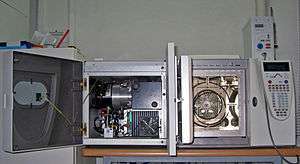 More complex measurements are often made in a laboratory requiring a water sample to be collected, preserved, transported, and analyzed at another location. The process of water sampling introduces two significant problems. The first problem is the extent to which the sample may be representative of the water source of interest. 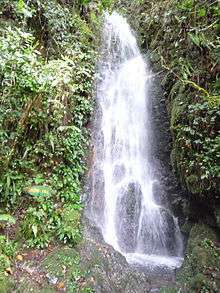 Many water sources vary with time and with location. The measurement of interest may vary seasonally or from day to night or in response to some activity of man or natural populations of aquatic plants and animals. The measurement of interest may vary with distances from the water boundary with overlying atmosphere and underlying or confining soil. 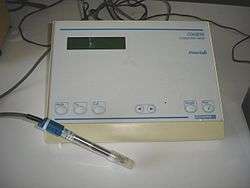 The sampler must determine if a single time and location meets the needs of the investigation, or if the water use of interest can be satisfactorily assessed by averaged values with time and/or location, or if critical maxima and minima require individual measurements over a range of times, locations and/or events. The sample collection procedure must assure correct weighting of individual sampling times and locations where averaging is appropriate. :39–40 Where critical maximum or minimum values exist, statistical methods must be applied to observed variation to determine an adequate number of samples to assess probability of exceeding those critical values. The second problem occurs as the sample is removed from the water source and begins to establish chemical equilibrium with its new surroundings - the sample container. Sample containers must be made of materials with minimal reactivity with substances to be measured; and pre-cleaning of sample containers is important. The water sample may dissolve part of the sample container and any residue on that container, or chemicals dissolved in the water sample may sorb onto the sample container and remain there when the water is poured out for analysis. :4 Similar physical and chemical interactions may take place with any pumps, piping, or intermediate devices used to transfer the water sample into the sample container. Water collected from depths below the surface will normally be held at the reduced pressure of the atmosphere; so gas dissolved in the water may escape into unfilled space at the top of the container. Atmospheric gas present in that air space may also dissolve into the water sample. Other chemical reaction equilibria may change if the water sample changes temperature. Finely divided solid particles formerly suspended by water turbulence may settle to the bottom of the sample container, or a solid phase may form from biological growth or chemical precipitation. Microorganisms within the water sample may biochemically alter concentrations of oxygen, carbon dioxide, and organic compounds. Changing carbon dioxide concentrations may alter pH and change solubility of chemicals of interest. These problems are of special concern during measurement of chemicals assumed to be significant at very low concentrations. Sample preservation may partially resolve the second problem. A common procedure is keeping samples cold to slow the rate of chemical reactions and phase change, and analyzing the sample as soon as possible; but this merely minimizes the changes rather than preventing them. :43–45 A useful procedure for determining influence of sample containers during delay between sample collection and analysis involves preparation for two artificial samples in advance of the sampling event. One sample container is filled with water known from previous analysis to contain no detectable amount of the chemical of interest. This sample, called a "blank," is opened for exposure to the atmosphere when the sample of interest is collected, then resealed and transported to the laboratory with the sample for analysis to determine if sample holding procedures introduced any measurable amount of the chemical of interest. The second artificial sample is collected with the sample of interest, but then "spiked" with a measured additional amount of the chemical of interest at the time of collection. The blank and spiked samples are carried with the sample of interest and analyzed by the same methods at the same times to determine any changes indicating gains or losses during the elapsed time between collection and analysis. The simplest methods of chemical analysis are those measuring chemical elements without respect to their form. Elemental analysis for oxygen, as an example, would indicate a concentration of 890,000 milligrams per litre (mg/L) of water sample because water is made of oxygen. The method selected to measure dissolved oxygen should differentiate between diatomic oxygen and oxygen combined with other elements. The comparative simplicity of elemental analysis has produced a large amount of sample data and water quality criteria for elements sometimes identified as heavy metals. Water analysis for heavy metals must consider soil particles suspended in the water sample. These suspended soil particles may contain measurable amounts of metal. Although the particles are not dissolved in the water, they may be consumed by people drinking the water. Adding acid to a water sample to prevent loss of dissolved metals onto the sample container may dissolve more metals from suspended soil particles. Filtration of soil particles from the water sample before acid addition, however, may cause loss of dissolved metals onto the filter. The complexities of differentiating similar organic molecules are even more challenging. Although water quality is usually sampled and analyzed at laboratories, nowadays, citizens demand real-time information about the water they are drinking. During the last years, several companies are deploying worldwide real-time remote monitoring systems for measuring water pH, turbidity or dissolved oxygen levels. Biological monitoring metrics have been developed in many places, and one widely used measure is the presence and abundance of members of the insect orders Ephemeroptera, Plecoptera and Trichoptera. (Common names are, respectively, Mayfly, Stonefly and Caddisfly.) EPT indexes will naturally vary from region to region, but generally, within a region, the greater the number of taxa from these orders, the better the water quality. Organisations in the United States, such as EPA offer guidance on developing a monitoring program and identifying members of these and other aquatic insect orders. Individuals interested in monitoring water quality who cannot afford or manage lab scale analysis can also use biological indicators to get a general reading of water quality. One example is the IOWATER volunteer water monitoring program, which includes a benthic macroinvertebrate indicator key. Bivalve molluscs are largely used as bioindicators to monitor the health of aquatic environments in both fresh water and the marine environments. Their population status or structure, physiology, behaviour or the level of contamination with elements or compounds can indicate the state of contamination status of the ecosystem. They are particularly useful since they are sessile so that they are representative of the environment where they are sampled or placed. A typical project is the Mussel Watch Programme, but today they are used worldwide. The World Health Organisation (WHO) has published guidelines for drinking-water quality (GDWQ) in 2011. The International Organization for Standardization (ISO) published regulation of water quality in the section of ICS 13.060, ranging from water sampling, drinking water, industrial class water, sewage, and examination of water for chemical, physical or biological properties. ICS 91.140.60 covers the standards of water supply systems. ↑ "What are Water Quality Standards?". Washington, D.C.: U.S. Environmental Protection Agency (EPA). 2016-03-17. ↑ World Health Organization (2004). "Consensus of the Meeting: Nutrient minerals in drinking-water and the potential health consequences of long-term consumption of demineralized and remineralized and altered mineral content drinking-waters." Rolling Revision of the WHO Guidelines for Drinking-Water Quality (draft). From November 11–13, 2003 meeting in Rome, Italy at the WHO European Centre for Environment and Health. ↑ Canencia, Oliva P; Dalugdug, Marlou D; Emano, Athena Marie; Mendoza, Richard; Walag, Angelo Mark P. (2016-08-31). "Slaughter waste effluents and river catchment watershed contamination in Cagayan de Oro City, Philippines". ResearchGate. 9 (2). ISSN 2220-6663. ↑ "Chapter 8. Data Analysis". Handbook for Monitoring Industrial Wastewater (Report). EPA. August 1973. EPA 625/6-73/002. ↑ United States Geological Survey (USGS), Denver, CO (2009). "Definitions of Quality-Assurance Data." Prepared by USGS Branch of Quality Systems, Office of Water Quality. ↑ World Health Organization (2011). "WHO technical notes for emergencies." Water Engineering Development Centre, Loughborough University, Leicestershire, UK. ↑ For an overview of the U.S. federal biomonitoring publications, see U.S. EPA, "Whole Effluent Toxicity Methods." ↑ Methods for Measuring the Acute Toxicity of Effluents and Receiving Waters to Freshwater and Marine Organisms (Report). EPA. October 2002. EPA-821-R-02-012. ↑ IOWATER (Iowa Department of Natural Resources). Iowa City, IA (2005). "Benthic Macroinvertebrate Key." ↑ "Center for Coastal Monitoring and Assessment: Mussel Watch Contaminant Monitoring". Ccma.nos.noaa.gov. 2014-01-14. Retrieved 2015-09-04. ↑ Dickens CWS and Graham PM. 2002. The Southern Africa Scoring System (SASS) version 5 rapid bioassessment for rivers “African Journal of Aquatic Science”, 27:1-10. ↑ "Guidelines for drinking-water quality, fourth edition". World Health Organization. Retrieved 2 April 2013. ↑ International Organization for Standardization (ISO). "13.060: Water quality". Geneva, Switzerland. Retrieved 2011-07-04. ↑ International Organization for Standardization (ISO). "91.140.60: Water supply systems". Retrieved 2011-07-04. ↑ Republic of South Africa, Department of Water Affairs, Pretoria (1996). "Water quality guidelines for South Africa: First Edition 1996." ↑ Hodgson K, Manus L. A drinking water quality framework for South Africa. Water SA. 2006;32(5):673-678 . ↑ National Archives, London, UK. "The Water Supply (Water Quality) Regulations 2000." 2000 No. 3184. 2000-12-08. ↑ U.S. Clean Water Act, Section 303, 33 U.S.C. § 1313. ↑ U.S. Clean Water Act, Section 303(d), 33 U.S.C. § 1313; Section 305(b), 33 U.S.C. § 1315(b). ↑ "Program Overview: 303(d) Listing". Impaired Waters and TMDLs. EPA. 2016-10-24. ↑ "National Water Quality Inventory Report to Congress". Water Data and Tools. EPA. 2016-08-18. ↑ More information about water quality in the United States is available on EPA's "Surf Your Watershed" website.